The southernmost region of Mary, with its fertile Murgab riverine oases, has attracted people since ancient times. Its capital Mary is the place from which the famous UNESCO World Heritage site of Merw can be visited, but also the excavation sites of the Margush civilization from Bronze Age times, of which the Gonur Depe archeological remains form the center. While Merw was at its largest at the time it functioned as regional capital of the Seljuk Empire, caravan traders have used the oases as stepping stone long before and long since. 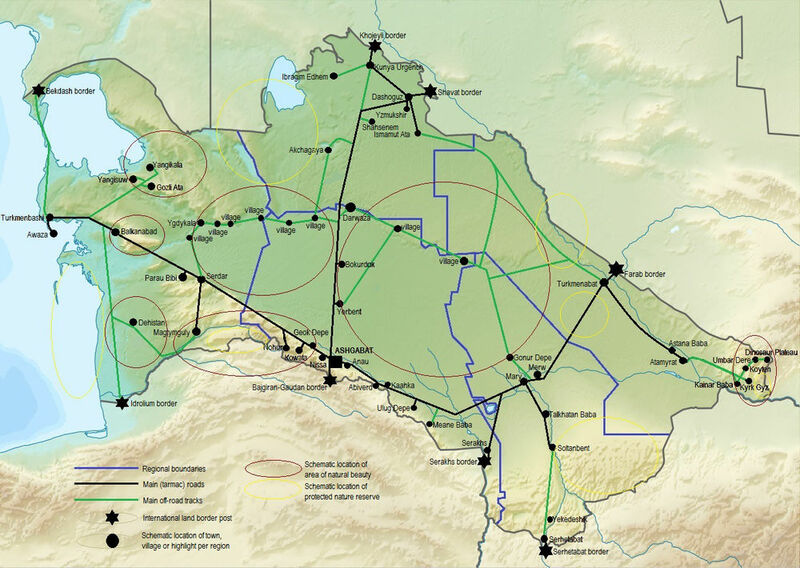 For caravans, Merw formed a cross roads on several routes, linking Khorezm, Bukhara and Samarkand to its north, to Bactria and Herat to its south when following the Murgab River to its origin. Even today, Mary Region has an entry point into Afghanistan. While the southern border areas are rarely visited and part of a protected national park, Mary and its many historical sites, see an ever-growing flow of visitors who want to experience the ancient Silk Road atmosphere. Mary is a pleasant town in its own right, with a bustling green-domed bazaar, and host to the famous Mary History and Ethnography Museum. 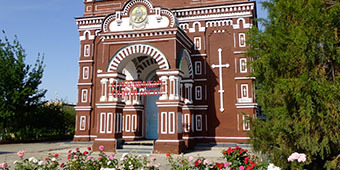 Mary is a typical provincial town, established in the 1880s by the tsarist armies as their next large hub on the Trans-Caspian Railway project, and successor of Bronze Age Margush and medieval Merw. A visit to the Central Bazaar is pleasant in its own right, but when you look carefully at the older stone structures, you find the remains of a tsarist bathhouse and teahouse. The Russian-orthodox Prokovskaya Church, the Art Gallery and a large newly-built mosque are also well worth a visit. Opened in 2009 at its new location in an impressive octagonal-shaped building, the museum houses the largest collection of artefacts found at the BMAC excavation sites of Bronze age Margush. 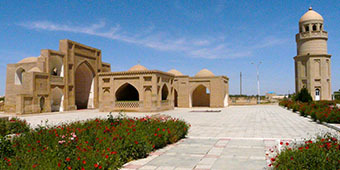 Next to the halls with historical items, the museum has a good local flora and fauna section, and a wonderful ethnography hall, displaying aspects typical of local nomadic lifestyle: household items, jewelry, embroidered costumes, carpets, musical instruments, a yurt, and a decorated horse and camel. 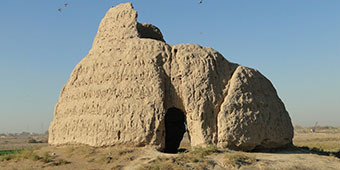 Merw, located at the former banks of the Murghab River, was the most important Silk Road hub in the region, and particularly thriving as regional capital under Seljuk governor Sanjar. Merw is the collective name of five urban centers that existed under various different names in different periods of time from the VI c BC up to the XVIII c AD. 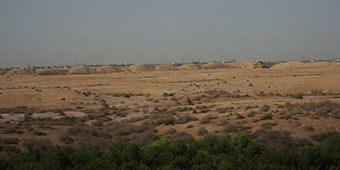 The entire 120 ha site of Merw has been recognized as a UNESCO World Heritage Site since 1999. Erk Kala shows the first step in the process of urbanization in Merw. The smallest and earliest site, also known as Alexandria-Margiana, comprises 20 hectares and was enclosed by massive walls and a moat. The only entrance-way had a ramp leading straight to the city. 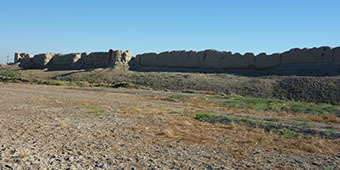 Archeologist Georgina Hermann described it as ‘One of the most imposing sites in Merw.’ The city’s wall was continually reinforced until the early Islamic period when both Erk and its extension Gyaur Kala were gradually abandoned. The Seleucids added a second walled city (IV c. BC), known today as Gyaur Kala, but which experts belief to be Antiokhia-Margiana. The 360 ha area town planning reflects a Hellenistic grid pattern. In the middle are the now indistinctive ruins of a mosque. In the south east corner is a mound which covered the remains of a Buddhist stupa and monastery. Important finds included the ’Merw vase’ and the clay head of a statue of Buddha, now both in the National Museum in Ashgabat. The Seljuk regional capital, consisting of an ark (governmental quarters), a shakhristan (citadel) and a rabat (bazaar), considerably exceeded Damascus and Jerusalem in size and population. Today the Seljuk citadel is called Sultan Kala. Adjacent to its two predecessors, and oval in shape, it occupies about 630 hectares. Its layout is still visible in aerial pictures. Among all city sites of Merw, perhaps the most significant is this medieval Seljuk city. A few kilometers to the south of the ruins of the medieval Sultan Kala we find the post-medieval city, known today as Abdullakhan Kala, constructed in the period that Timurids ruled the area. Despite being one of the strongest and best fortified cities in the area, Abdullakhan Kala never reached the importance of its predecessors, although the city walls are still impressive. 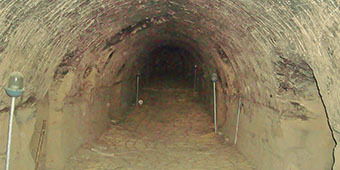 Bairamali Khan Kala (XIX c.) was the last clay-walled urban site in Merw, and has been poorly preserved. The highlight of an excursion through Merw is a visit to Sultan Sanjar’s mausoleum, the tall brick walls of which still dominate the landscape and functioned as a landmark for traveling caravans. 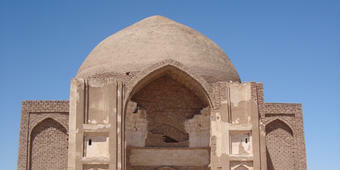 This central-cupola building without portal is typical of the Khorasan architectural style. The mausoleum was created by Mohamed, the son of Atsyz of Serakhs, whose name we can find on a medallion below the cupola of the mausoleum. During Seljuk Sultan Sanjar’s reign the Shahriar Ark was constructed - a citadel within the citadel, protected by its own walls and moat. It housed crucial governmental and military buildings. One of those construction is what is today called “kepterkhana”, an interesting corrugated structure, which is the best-preserved within the citadel. It’s walls still survive to a height of some 4,5 m, but its function remains debatable: from library to pigeon house. Another monument from the time of the Seljuk rule is the mausoleum dedicated to Mohamed ibn Said, with remarkable interior decorations. It remains unclear whose shrine is inside. Local legends speak about Mohamed Said ibn Zeid ibn Ali Zeinal Abedon ibn al- Husein ibn Ali-Talib, who was a prominent Shia teacher and direct descendant of the Prophet Ali. Although he died four centuries before the mausoleum was built, his name is on the inscription inside the mausoleum. 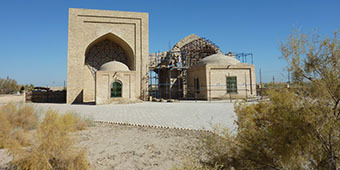 The important complex includes a recently built mosque and minaret, the shrine and grave of Yusuf Hamadani (died in 1140), a Timurid iwan (portal), a prayer hall and pilgrim guesthouse facilities. Yusuf Hamadani was a famous Sufi scholar of the 12th century, and the first of a group of Central Asian Sufi teachers who founded the Naqshbandi order. He was born in 1048-49 in a small settlement called Bezendjird, close to the famous Iranian city of Hamadan. Two outstanding massive monuments dating back to the Sassanid period are still visible on the territory of Ancient Merw - the Big Kyz Kala and Small Kyz Kala (VI-VII cc). The Turkic name (in all Turkic languages’ Kyz’ means ‘girl’) probably doesn’t reflect the actual origins or function of the constructions. 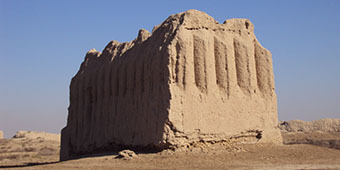 These rectangular clay castles - ‘Koshks’ have an interesting architecture, decorated from outside with corrugated walls, and various vaults. 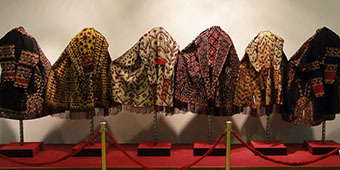 Original set of graves from the time after the death of the prophet Mohamed, when ashkhabi (“companions/campaigners of the Prophet”) helped the spread of the Islamic faith in their locality. 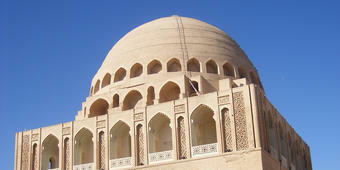 The graves of two askhabs are of Al Khakam Gifari (died in 670) and Bureyda Al Aslami (died in 681). At the time of their death the graves were constructed; in the 15th c. (Timurid era) aiwans were added, and in the 19th c the mausoleums were constructed over the graves by Guljemal Khan. 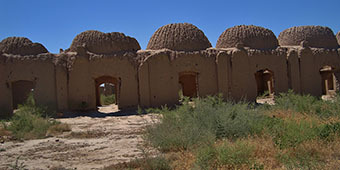 Various Ice houses (approximately XV c., Timurid rule) are visible in agriculture fields surrounding Merw. They are located above the ground, and are different from sordoba, water collection puts. They are of an extraordinary conical clay construction, built directly on the ground to store tightly packed snow. The original height is hard to determine. From 1971 onwards archeological teams did discoveries that reveal the importance of this area as a possible fifth center of ancient civilization, next to Mesopotamia, Egypt, India and China. 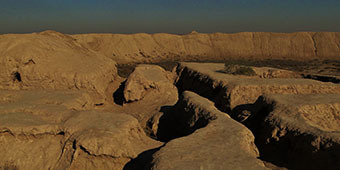 Research established that in the II millennium BC the center of population drifts away from the oases of the Kopetdag plains in Southern Turkmenistan, to the Murghab River delta oasis. Gonur Depe was the center of “Margush’ , and had direct relations with Bactria in Northern Afghanistan. Talkhatan Baba, located near the Murgab River near Yolotan town, is the name of an intricately brick decorated mosque, constructed in 1095 in the heydays of Seljuk rule of the region. The mosque is considered an exquisite example of this style construction and one of the best preserved mosques displaying Seljuk architectural master class. The grave of sheikh-mystic Talkhatan Baba is located here. Nearby is Ahun Baba, a madrassa (XIX c AD) called Kyrk Gummez (or Forty Cupolas), because it is made up of a courtyard surrounded by a square structure covered by 10 cupolas on each side. The Ahun Baba madrassa is named after a local mullah-teacher. 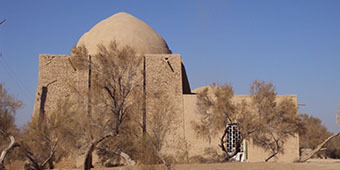 The madrassa was located en route from the medieval Silk Road center of Merw to the Soltanbent Dam. 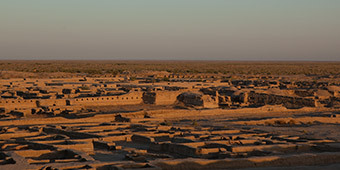 It is visited by the local Baluchi community that lives in the surrounding villages. Old Serakhs (VI c. B.C. 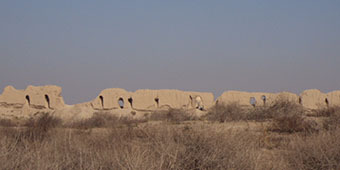 - XIX c. A.D.), one of the largest archaeological monuments of Southern Turkmenistan, is an urban site located at the upper reaches of the Tejen river near Serakhs. 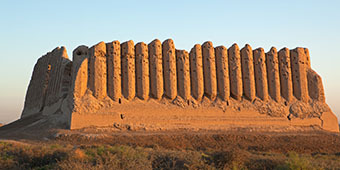 Serakhs was the center of a rich oasis and trade junction between Merw and Nishapur, with a citadel surrounded by a walled shakhristan and a vast rabat. 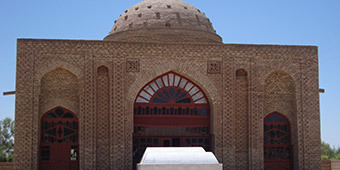 Within the shakhristan is the mausoleum of Abul-Fazl (Serakhs Baba), constructed in 1024, a masterpiece of the Serakhs architectural school. 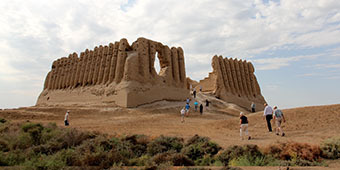 The complex of Yekedeshik is near Tagtabazar, which can be reached by an 8-hour strenuous drive from Mary. Caves stretch along the steep right bank of the Murgab River and over the Karabil Height. Surface investigations of the surrounding locality revealed a number of similar caves along the whole right bank of the Murgab. They stretch up to neighboring Afghanistan. The caves were supposedly Buddhist complexes, a great number of which survived in neighboring countries.